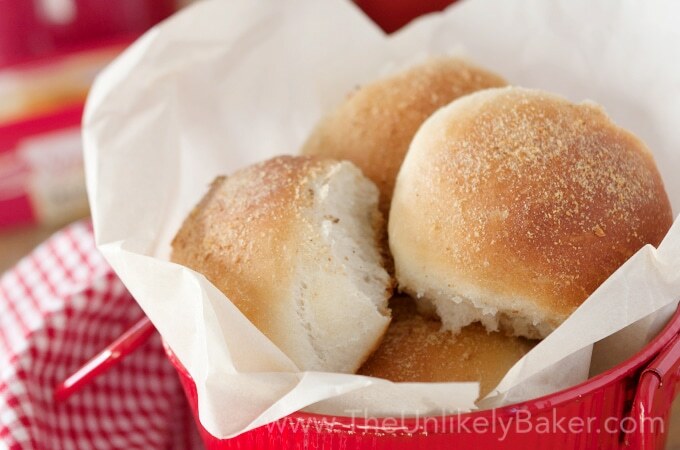 Here’s an easy pandesal recipe so you can make the quintessential Filipino bread roll at home. It’s crunchy outside, soft and fluffy inside, perfect with butter or dipped in your morning coffee. Are you a Filipino living abroad like me? Then you’re probably thinking why bother making pandesal at home when you can get them pretty easily at the Asian store. One reason: nothing beats the smell of freshly baked pandesal filling your kitchen. And it’s not just any smell. It’s THE smell. One sniff of freshly baked pandesal and I’m back at my nanay’s dining table, eating pandesal filled with Lily’s Peanut Butter that she prepared for me after school. Or it’s a Sunday morning and I’m happily eating pandesal (out of those little brown paper bags) that my mom bought from the local panaderia after church. Not a Filipino? Then you are in for a treat. 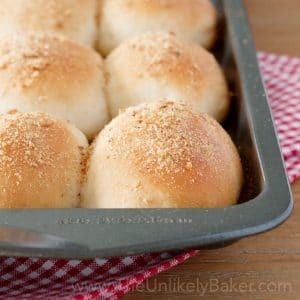 Unlike dinner rolls or the regular loaves of bread we get, this recipe for Filipino bread rolls is egg and butter-free, has a very subtle hint of sugar and salt, crunchy outside and soft inside. It’s certainly unique and absolutely delicious. Give it a go and find out why Filipinos all over the world love it. So what is pandesal bread? Wikipedia puts it very simply as “salt bread”. Ironically, it’s more sweet than salty. And it has a really rich history for such a humble bread. Check this out if you’re so inclined, it’s quite an interesting read. And there are different kinds of pandesal; I dare say it’s as varied as the number of islands in the Philippines! (And that’s a lot). So I can’t claim that this pandesal recipe is for the traditional pandesal; I’ve eaten different kinds (big, small, light, dense) to know that each province, town or city probably has their own version so there’s technically no traditional kind. What I can say is that this is the pandesal bread I grew up eating. Crunchy, soft, sweet and salty all at once. And not to worry. I’ve looked around for pandesal recipes for a long time and this is the result of me tweaking and trying to make it easier. And it is. I’m a home baker like you and I like shortcuts as much as the next person so if I can make this beloved Filipino bread at home, you can too. If you look at the recipe, it’s just a lot of steps but they are easy, baby steps. Manageable steps to make the whole process that much more achievable. I won’t lie to you though, if you scroll to the recipe below – between the kneading and the waiting (the dough has to rise twice) and the baking – it probably is quicker for you to get in your car, drive to the store and buy pandesal. But there’s something so fulfilling about making your own bread. And I’m not kidding about the smell. I may or may not have cried. What are the ingredients of traditional pandesal? are involved too. That’s what makes pandesal so unique!
. I don’t use a mixer and stir everything by hand. with a dough blade, you can use those. I just choose to stir and knead the pandesal dough by hand because it gives me greater control and I have less chance of over-kneading it. Which brings us to pandesal baking tips. Like I mentioned above, I recommend kneading Filipino bread rolls by hand until smooth and elastic. Here’s a great resource on how to tell when your dough is properly kneaded (hint: when you’re tired!). When making bread, I use my pre-heated oven as my “dry warm place”. What I do is turn it on for a few minutes then turn it off so that it’ll be about 90F when I’m ready to put my dough in to rise. Just remember to remove the dough from the oven when you’re ready to actually preheat for baking.
. This is true for all baking, actually. While you can get away with volume measurements with a lot of recipes, bread making is more exact so it’s always better to weigh your ingredients. We bought our kitchen scale years ago for less than $20 and it’s one of the most used gadgets in our kitchen. is useful as well (e.g. instead of approximating the temperature of the water to mix the yeast in, you can measure it for sure). This is great for when you’re tempering chocolate too. How long does homemade pandesal last? Pandesal bread is best eaten fresh out of the oven. However, they will last for up to 2 days on your counter in an airtight container. If you plan to keep them for longer, freezing them is a better option. Love breakfast? 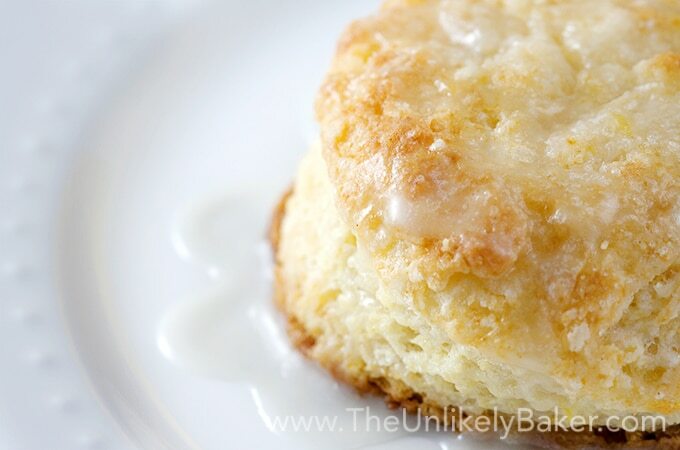 If you have 15 minutes, you can make these delicious and oh-so-flaky buttermilk scones – no mixer, no problem! They are fully customizable too so you can mix in your favourite things like chocolate chips or dried cranberries. 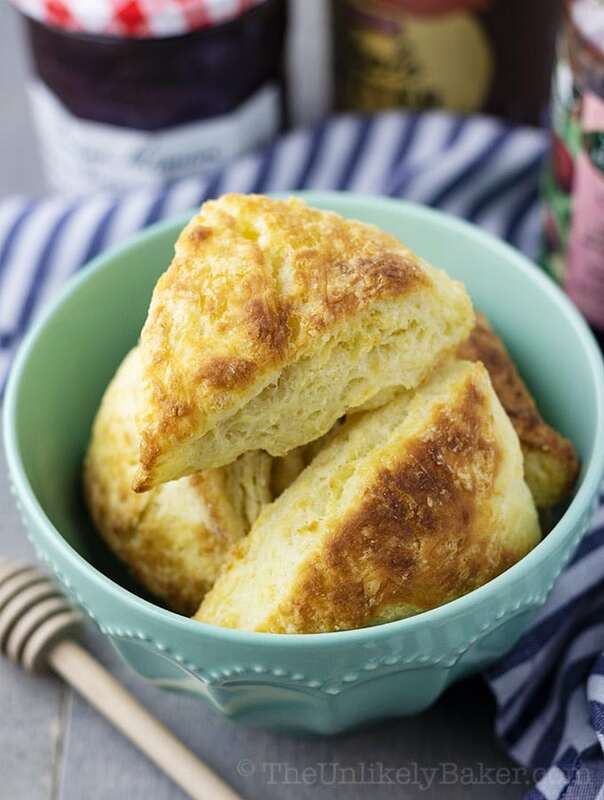 Though if you prefer to stick to the basics but still want a little excitement, these scrumptious lemon buttermilk scones are just what you’re looking for. In the mood for pancakes? 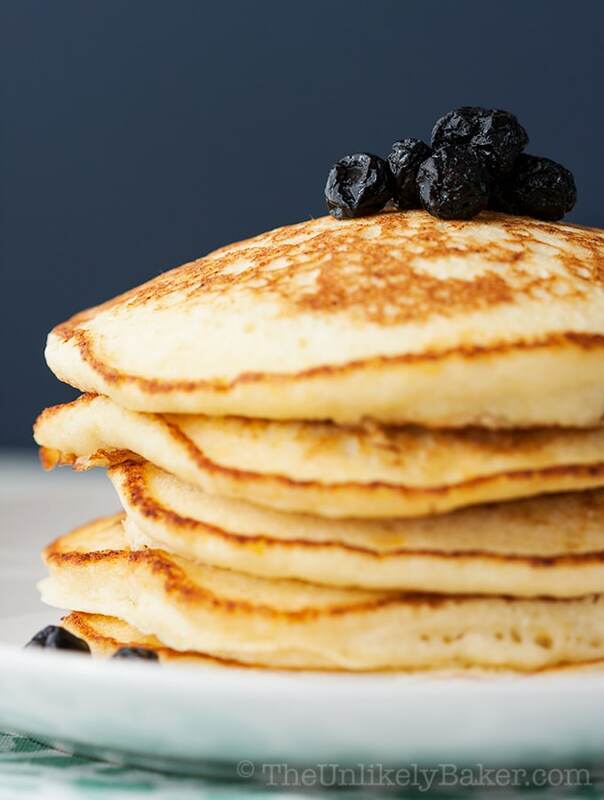 Try these light, fluffy-as-a-cloud, lemon ricotta pancakes. So good! 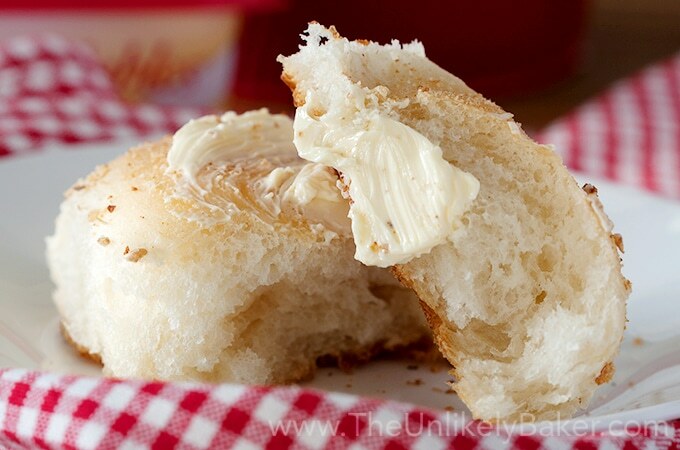 Here’s an easy pandesal recipe so you can make the quintessential Filipino bread roll at home. It's crunchy outside, soft and fluffy inside, delicious. In a medium sized bowl, stir 2 cups warm water, 2 teaspoons active dry yeast and 1 teaspoon sugar until dissolved. Set aside and let stand until bubbly (about 10 minutes). In a large bowl, stir 2/3 cup sugar and 1/4 cup oil until fully combined. Add 2 teaspoons salt, your yeast mixture and 1 cup flour. Stir until incorporated. Proceed to add the rest of your flour 1/2 cup at a time combining well after each addition. Oil a large bowl with 1 tablespoon oil. Place your dough in the bowl and turn to ensure the whole dough is coated. Cover with a damp cloth and allow to rise in a dry warm place (about 90F) until it doubles in size (about 2 hours). Once the dough is ready, turn the dough into a lightly floured surface and knead slightly. Weigh the dough and divide into 32 pieces. Shape each piece into an oval, like an egg, and place onto a lightly greased baking sheet (you would need two baking sheets - 16 pieces per sheet). Make sure to keep about a quarter inch space around each piece to allow them to rise further. Cover each baking sheet with a damp cloth and allow to rise a second time (about an hour). Preheat your oven to 375F. 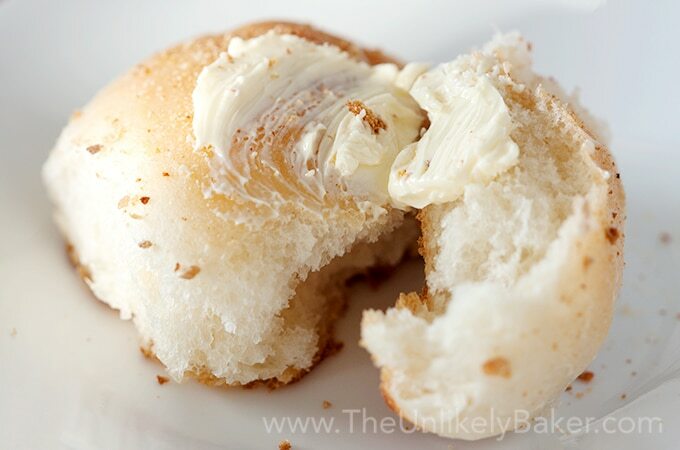 Sprinkle bread crumbs on top of the pandesal and bake until golden brown (15-20 minutes). Since you're using 2 baking sheets, you may want to rotate/switch the sheets midway through. See post for tips on how to bake pandesal. Did you try this pandesal recipe? I’d love to hear from you in the comments section below. Thank you for sharing this! I am also a Filipino living abroad and Id like to prepare this for my family. The one you buy from the Asian store is different from freshly baked pandesal. Perfect match with Lily’s peanut butter or just salted butter. Hello Kit! My pleasure 🙂 And yes, totally agree about freshly baked pandesal. I love the smell of it baking but I especially love it with Lily’s or DariCreme. Only Lily’s is available here though, and I wonder if they still sell DariCreme back home?? I’m craving both now lol. Hi jolina your recipe is precise but didn’t make it yet. I just give birth and craving for pandesal. Can I use bread flour instead of all purpose flour since that is available in my pantry now? Hi Cecile, congratulations! Hope mom and baby are doing great 🙂 I haven’t actually worked with bread flour but according to this article I found, they can generally be substituted for one another – https://www.thekitchn.com/whats-the-difference-between-ap-flour-and-bread-flouringredient-questions-173175 Hope it helps! Omg! Delicious I definitely will bake these up again. I didn’t have bread crumbs so I made my own. I think next time I’ll add more crumbs to the top. Mine turned out more round than oval. I hope they stay soft for tomorrow what to take some to my daughter. thanks for sharing. The ubiquitous pandesal easily available at the corner bakery in the Philippines, that you’d missed it here in the U.S. I’ve tried different bread dough recipes to make pandesal like the sour dough, buttermilk dough, challah dough. Yours a keeper. It freezes well too, and remains soft and chewy, not crumbly after it thaws at room temperature. Thank you for sharing. Hi Liza, happy to hear you liked it! I love pandesal and I think my favourite part about baking it at home is the wonderful smell that fills our whole house. Transports me back home. Hope you’re having a lovely Saturday! Yum! I am so trying these! I haven’t ever heard of these, but they look incredible! I am always amazed at how many different bread recipes there are. Excellent recipe! I am going to have to make this as a surprise for some of my Filipino friends – I’m curious if they say anything without prompting. And dipped in morning coffee? Intriguing! Oh my goodness! Yum! I cannot wait to try these! These would be a great addition to our cookery! I’m pinning it for later. They look soft and fluffy! I am so trying this. I have been wanting to try to make my own bread and rolls! Awesome! Go for it 🙂 Hope you like them Katie! This bread sounds so good. I wish I has smell-a-vision. This might be my next bread try. I love baking bread and this is a recipe I definitely want to try. I had never heard if pandesal before. Ooh, these look so delicious!! I love pandesal and I live right down the street from a bakery that cooks some so I can smell it in the early morning so I know what you mean about the smell. I have the convenience of buying some from there but I think I’m going to try baking some myself. Now all I want is some pandesal with butter. I LOVE homemade bread/roll recipes. It’s one of the things we indulge in quite often. Your recipe looks absolutely spectacular. I’m definitely adding it to my list. Thank you! I’ve only recently learned to make my own bread and now I cannot stop. I love it 🙂 Thanks Tasia! Hope you like pandesal. These rolls look lite, fluffy, and incredibly delicious! Like you said they may take some time and effort but they definitely look worth it and I can’t wait to try them soon ! Absolutely! I find making bread so fulfilling. Hope you like pandesal Cait! These look so delicious! I know my husband would love them…he loves ethnic food of ALL kinds! Yasssss! You are so right about all the smells of fresh bread in your house. Totally worth the time to bake. I thought it was funny you talked about traditional pandesal. All Filipino ladies are switching up the recipe every time they make it! HA HA! Now I need to go bake me some! These rolls look absolutely wonderful! Perfect with spread of butter over them! Especially fresh and hot from the oven 🙂 Thanks Catherine! 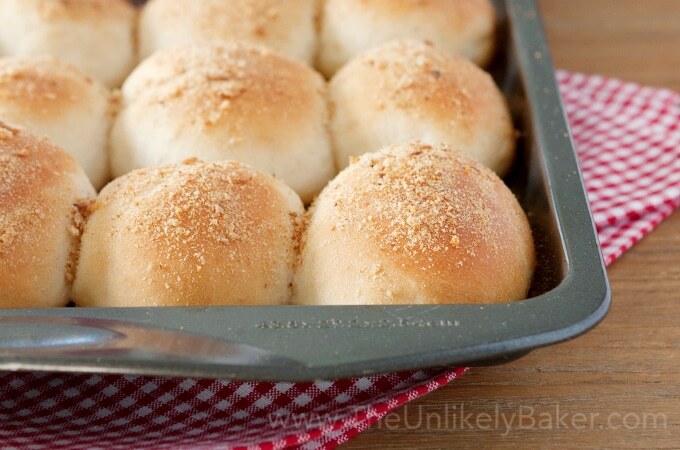 Looks like a versatile roll recipe that could be used for a variety of occasions. Can’t beat the scent of freshly baked goods in your kitchen! I love it when the whole house smells of it! So wonderful. It almost makes me less sad about the clean-up lol! Ohhhhhhh!!!! Those look so soft and pillowy. I’ve never tried filipino bread rolls before– clearly that needs to change. Hope you like them Julie! Funny how smells/food can bring you right back. I’ve never had this type of bread before, but I know that I would love it and there’s nothing like the smell of freshly baked bread going through house, is there? Do you remember the scene in Ratatouille when the restaurant critic takes a bit of food and instantly he is transported to when he was a child? I think we all have certain things that do that for us, whether it is a smell or taste. Pinning these and trying soon 🙂 Cheers to a lovely week, Jolina! Ohhhh I love that movie and yes I remember that scene! Something about food and smells eh? Almost like magic I think. Thanks for the pin Dawn and have a wonderful week too! Me neither, until I tried and now I can’t stop lol. Hope you get to try it Sarah! I’ve started to be more brave with my baking and branching out with bread recipes. I’m definitely adding this one to the list! Me too, that’s my goal this year actually, get better at bread making 🙂 Hope you like pandesal Lisa! I miss this! Nothing beats having pandesal dipped in coffee for breakfast every morning! Thanks for sharing! Right? 🙂 I usually dip mine in hot Milo and it’s just as good! Do you think I could substitute the Conor’s oil without compromising the integrity of the recipe? Hi Shannon! I’m afraid I’m not sure what Conor’s oil is…but you could use vegetable oil or any oil that’s flavourless 🙂 Would love to hear how it goes! This looks so delicious I WISH I could smell it through my monitor. I haven’t tried the recipe (yet), but I love baking bread. Yes, it would be faster to drive to the store but like you said, I can’t get that smell in my house without baking! Haha you can’t, can you? Not even if you toast the bread I don’t think (well maybe you can you but not the same). Hope you like pandesal Jaime! 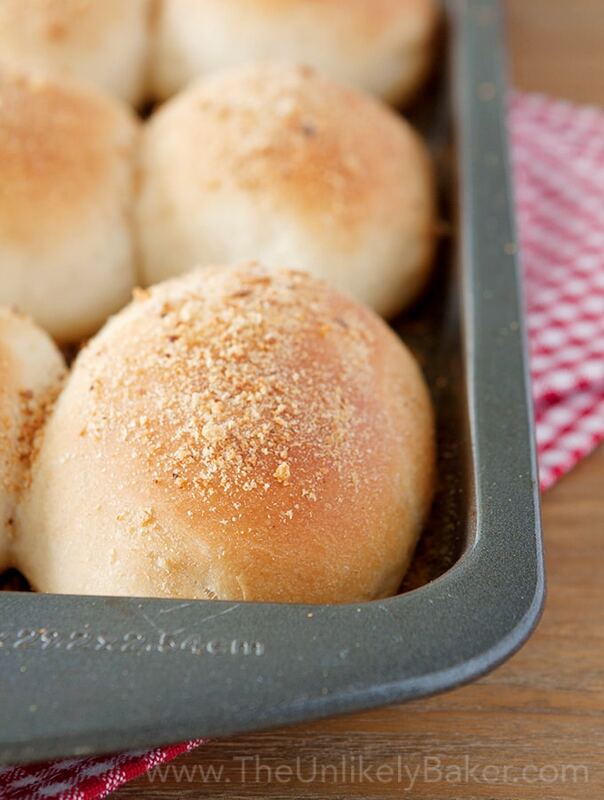 Nothing like warm rolls made right at home. I also love recipes that include everything I pretty much already have on hand at home. Can’t wait to try this! Those are the best ones IMO 🙂 Simple but delicious! That bread looks amazing. I can only imagine how lovely the smell of it baking would be. I’m going to pin it for later. Nice! Hope you guys like pandesal as much as we do 🙂 Thanks Andrea! Recipe looks great! I’ll try it sometime! These sound amazing- I have only ever had these in restaurants and never would have imagined how labor intensive they are. Makes you appreciate dining out a bit more! I need to try them for home- I know my husband and kids would be pleasantly surprised! I know! It wasn’t until I started to learn to bake that I started to appreciate all the work that goes into the tiny cupcake I’m eating at our local coffee shop lol. It’s so fulfilling though. Hope you guys like pandesal Chelley! I love how easy this bread is too make and the fact that it’s crunchy, sweet and salty. I have only recently been trying more yeast recipes. For some reason yeast does not always like me. These look divine. It didn’t like me either but I found practice makes perfect! Well…not PERFECT but I’m getting better at it (I think lol!) Thanks Maria! These look delicious! I would like them with a side of pasta for sure! I’ll try this out use pandesal with my slider recipe. That’s my plan too! Watch out for pandesal sliders to show up on the blog soon-ish 🙂 Thanks Robin!